Competing in charming, history and historic buildings with squares like Obradoiro in Santiago or María Pita in Coruña, Fefiñanes square, stoned square located in the centre of Cambados, it is a place from the 16th century formed by the Fefiñanes Pazo, the Bridge Arch, the Atalaya-Mirador and the Church of Saint Benedict which recreates an architecture of Italian imitation. 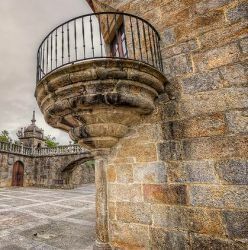 Fefiñanes Pazo was built initially in time of Felipe II by an assessor and then the family of Figueroa Marquises gaved it the actual L-shape appearance. Behind the house, there is a beautiful galician garden full of hortenses and trees. As a curiosity, in past times the sea reached the square.